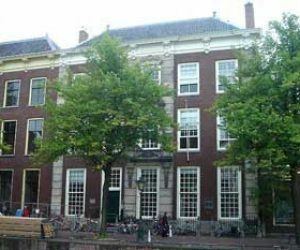 The Printroom of the Leiden University is housed in a stately mansion on Rapenburg 65 in the center of Leiden and has a long building history which dates back to the late middle ages. The building Rapenburg 65 as we know it today originates from a fusion of 2 small late medieval houses with a monumental front that was added later in the 18th century. These two gothic houses would in course of time be enlarged, altered, rebuilt, redecorated etc. , depending on the owner/occupant, prevailing fashion or purpose of the building. The first known owner of Rapenburg 65 is Willem van Alkemade who came in possession of the house in 1444. Matthijs van Overbeke who bought the house in 1623 was the first occupant to radically alter it by building an extension to the house at the back. He added a large kitchen and two parlours flanking a long corridor leading to the garden. The next cause for alterations was in 1652 when Rapenburg 65 was sold separately from the adjacent building Rapenburg 67. Until that time both houses had been jointly occupied and a connecting door had been made in the partition-wall. With the separation in 1652 this door needed to be bricked up and a new, separate entrance for Rapenburg 65 was made by splitting up the left front parlour in two smaller rooms and by leading a corridor through it which led from the front-door to the back-house. Pieter de la Court van der Voort, a wealthy cloth manufacturer and merchant, rebuilt the back-house in 1723. A new stately hall and staircase was constructed with a stucco ceiling made by G.B. Luraghi. His daughter, Catharina Meerman, was responsible for the monumental front of the house as we know it today. When she inherited the building in 1748 the front consisted of two narrow 16th century gable-ends which was totally out of tune with the interior that had already been turned into a worthy manor-house by the former occupants. So in 1749 she had an imposing, broad front constructed that was more fitting with the standing of the building. At the same time the rooms in the front-house are rebuilt by raising the ceilings and decorating them with stocco. In the last quarter of the 18th century the families Twent and Gaubius would replace the frivolous rococo decorations by more severe neo-classicist garlands in accordance with the prevailing Louis XVI style. The still existing doors in the hall and corridor also date from that period. Furthermore the corridor in the back-house gets replaced to the far left side of the house. No note-worthy alterations were made by the succeeding occupants in the 19th century yet there is one occupant worth mentioning namely Nicolaas Cornelis de Gijselaar, son of Cornelis de Gijselaar who bought the house in 1799. Nicolaas Cornelis was a well-known collector of prints and drawings. He donated his collection to the Prentenkabinet of which he would even become director for a short period of time (1849-1851). In 1928 Nicolaas Charles de Gijselaar, grand-nephew of Cornelis de Gijselaar, sold the building to the V.V.S.L., the female student society of Leiden, who intended to use the building as their club-house. This new destination called for a reorganization op the building especially of the first floor which had become a maze of rooms and corridors. It was not until 1958 that work began on a largescale renovation of the building with the intent to preserve and restore as many elements as possible in the original state. The V.V.S.L. occupied Rapenburg 65 till 1971. It was sold in 1973 to the L.U.F., the Leiden University Fund. 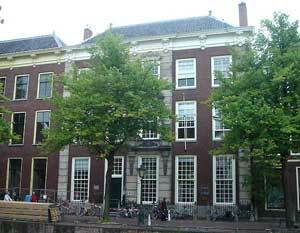 The university of Leiden rented the building from the L.U.F. and housed the Prentenkabinet and part of the department of art-history in it. The large garden-parlour in the back-house was fitted up as library and reading-room and the two large rooms on the first floor at the front of the house became exhibition- and reading-room for the photography department. The remaining rooms are used as working-space for the staff. In 1982, when the department of art-history moved out of Rapenburg 65, the whole building was taken into use by the Printroom of the university of Leiden and the Studycenter for the history of photography who have been the sole occupants ever since.